instead of asking your opinion on whether it should be built, it asks for the “result” – whether it will be built? I think it is a trick question – that suggests that the TMT is a DONE deal, that it is inevitable – that it WILL be BUILT. I suspect that the powers that be will then SPIN the “suggestion” to make it into a reality! On Wednesday, June 24th construction of the $1.5 Billion Thirty Meter Telescope (TMT) on Mauna Kea was again halted by more than 700 people standing together to protect the sacred temple from further desecration. 13 telescopes currently exist on the Mauna. 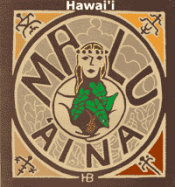 It was an awesome gathering on the Mauna. Following prayers and chants, keiki gave ti-leaf lei to the police and exchanged hugs to start the day. How good is that. Not a dry eye around. 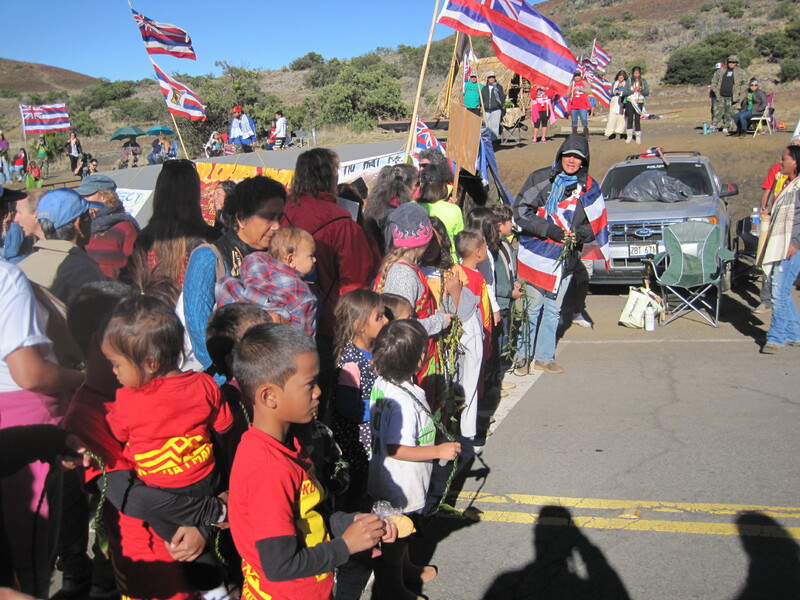 Mahalo to all who came in a spirit of “Kapu Aloha” to stand for the sacred above dollars. 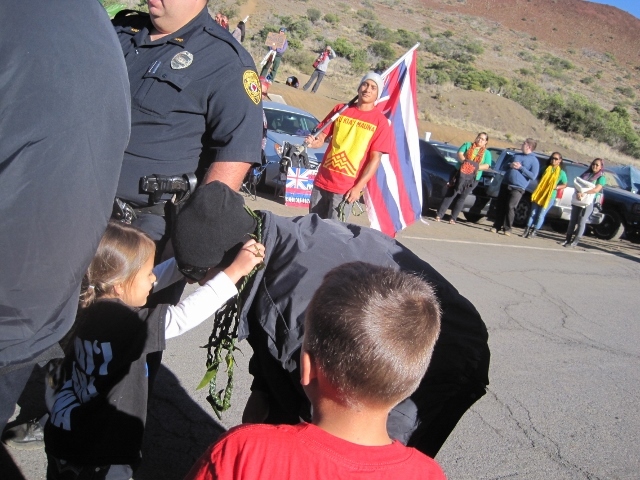 As the construction caravan tried to push its way up the mountain with police in front, line after line of protectors chanted, prayed, sang, and stood firm in saying We are Mauna Kea. No TMT. Photos tell the story better than words. See the links below. 12 more protectors were arrested June 24th in addition to the 31 arrested on April 2nd. 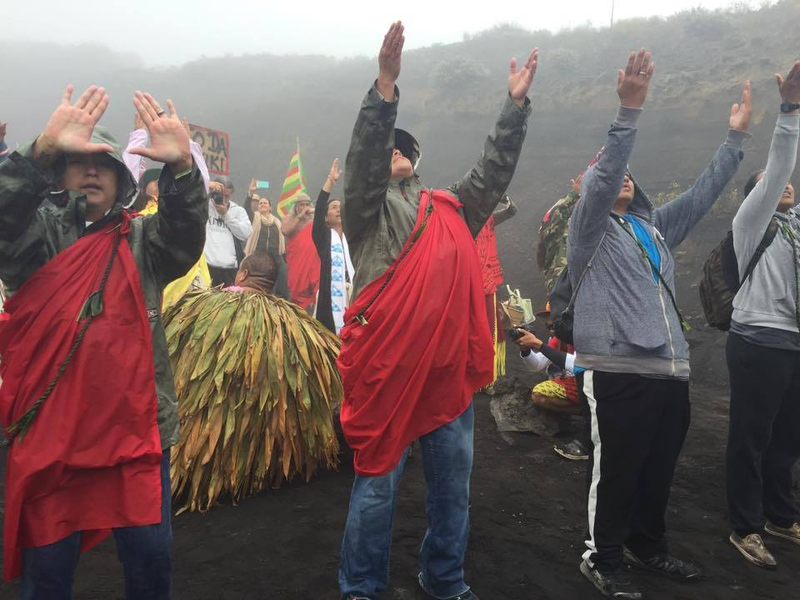 Several of those arrested in April are requesting to engage in Ho’oponopono (an Hawaiian cultural process to make right) with Governor David Ige, TMT President Henry Yang, University of Hawaii President David Lassner, and DLNR Deputy Director, Kekoa Kaluhiwa and/or their representatives. The request is supported by Hawaii County Prosecutor, Mitch Roth, and Hawaii District Court Judge Barbara Takase. Governor has announced TMT construction again halted indefinitely. Another opportunity for ho’oponopono to set things right.